The aircraft carrier USS Hornet had 16 AAF B-25s on deck, ready for the Tokyo Raid. In the spring of 1942 U.S. morale slumped because of the numerous Japanese successes. The country desperately needed a victory. 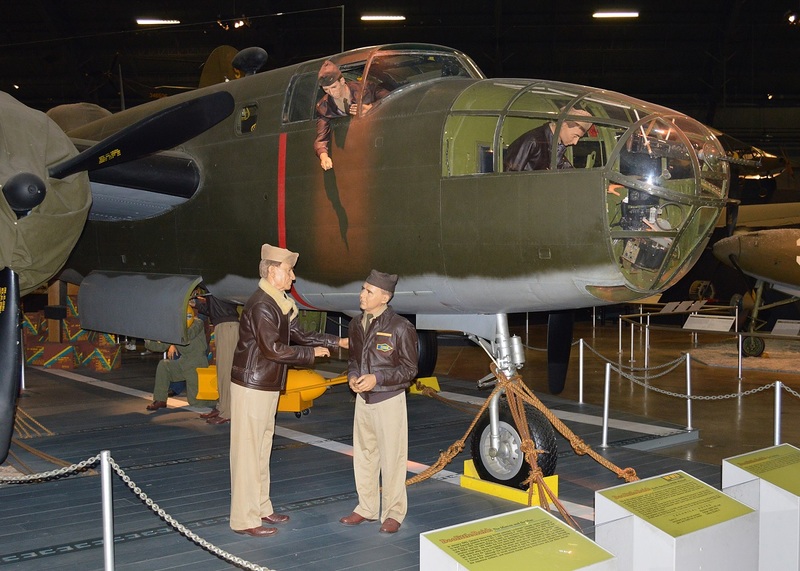 As explained by National Museum of the U.S. Air Force article America Hits Back: The Doolittle Tokyo Raiders, Capt. Francis S. Low, a U.S. Navy submariner, came out with the idea to perform a strike against the heart of Japan by means of U.S. Army Air Forces (USAAF) medium bombers flown from a U.S. Navy aircraft carrier. Gen. Henry “Hap” Arnold assigned the difficult task of training for and leading the raid (which was named Special Aviation Project No. 1) to Lt. Col. James Doolittle a brilliant aviator and compelling leader. According to National Museum of the U.S. Air Force article Doolittle Raid, Doolittle became a flying cadet and received his commission in 1918 after having enlisted in the Army in 1917. In the late 1920s and the early 1930s, he won the prestigious Schneider, Bendix and Thompson aviation trophies and in the 1929 Doolittle made history when he performed the first blind flight where he depended upon aircraft instruments during take off, flight and landing. He left the Army Air Corps in 1930, but he returned to active duty in 1940 when war appeared imminent. The B-25 Mitchell medium bomber was chosen by the USAAF for the task given that it was the only aircraft available with the required range, bomb capacity and short takeoff capability. The B-25Bs and 24 trained volunteer crews came from the 17th Bombardment Group, Pendleton Field, Ore. 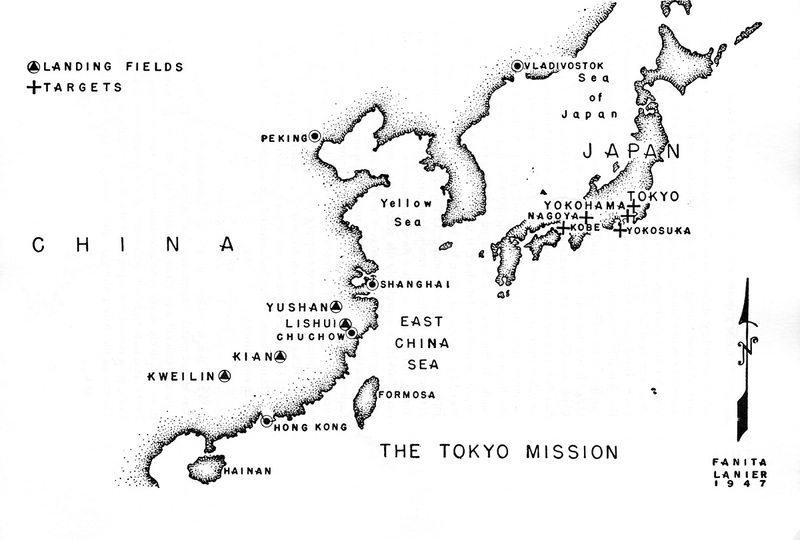 The B-25s had to take off about 450 miles from Japan, bomb selected targets at such locations as Yokohama and Tokyo, and then fly another 1,600 miles to friendly airfields in mainland China. The operation was risky: in fact medium bombers had never been flown from a carrier, and sailing so far into enemy territory endangered the U.S. Navy task force. The crews selected for the mission were trained at Eglin Field, Fla. where Lt. Henry L. Miller, a Navy pilot from Pensacola Naval Station, provided assistance on how to take off within 300 feet, the available distance on the carrier USS Hornet. Moreover the crews also practiced cross-country and night flying, navigating without radio references or landmarks, low-level bombing and aerial gunnery. Noteworthy because the Norden bombsight was ineffective at low altitudes, pilot and armament officer for Doolittle’s group Capt. C. Ross Greening developed a replacement device, which being connected to the cockpit through the pilot direction indicator, allowed the bombardier to give the pilot aircraft turn directions without relying on voice communication. Actually these bombsights were built by metal working shops at Eglin Field using materials costing 20 cents! USAAF personnel load .50-cal. 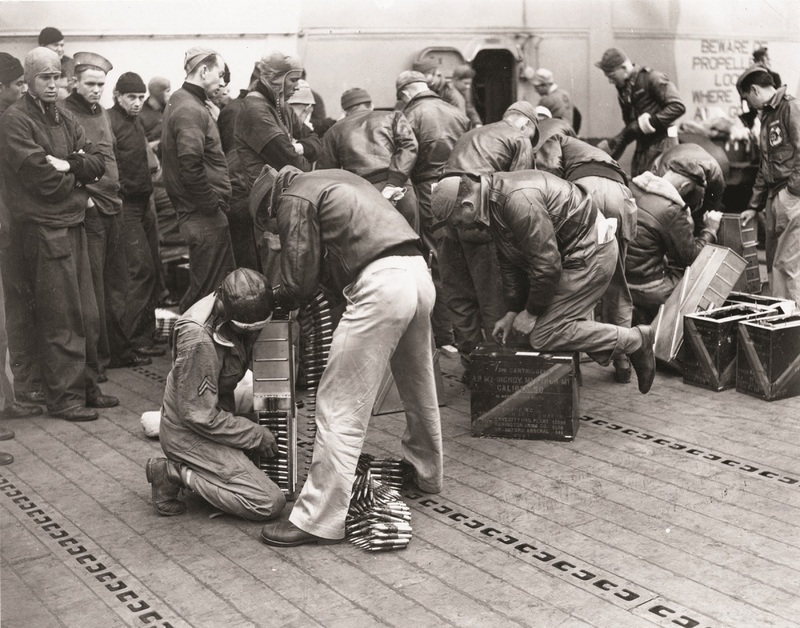 ammunition into ammo trays prior to takeoff from the Hornet as Navy personnel watch. By mid-March the crews completed their training and flew to San Francisco to embark their 16 B-25s aboard the newly-built aircraft carrier USS Hornet. On Apr. 2, 1942, Marc A. Mitscher, the Hornet’s captain, left for the secret mission in broad daylight not wanting to sail at night because of an inexperienced crew. At dawn on Apr. 18, 1942, the task force, commanded by Admiral William “Bull” Halsey, was steaming west through rough Pacific seas, about 650 miles away from Japan, when it encountered an enemy patrol boat. No one knew if it had radioed a warning to Japan before being sunk. 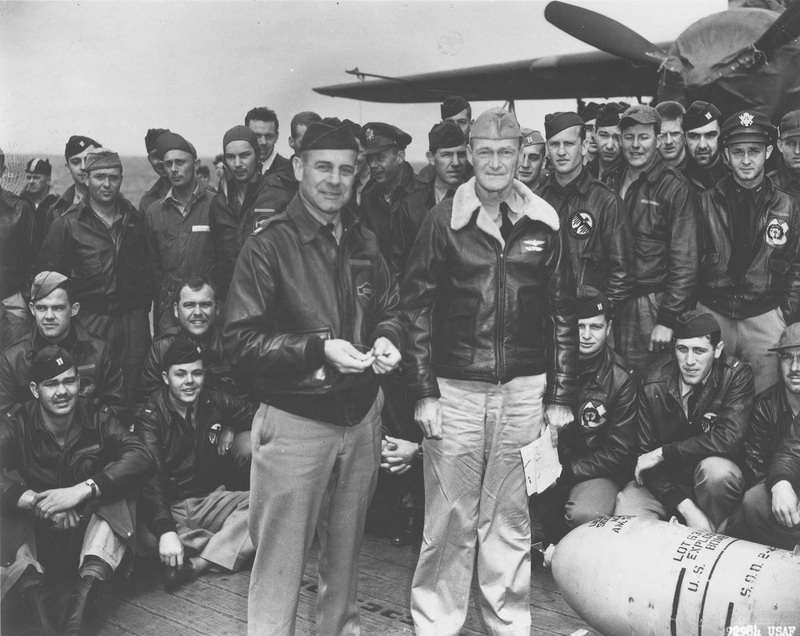 Col. Doolittle and Admiral Halsey had a difficult choice to take:cancel the raid or launch earlier than planned and risk running out of fuel. 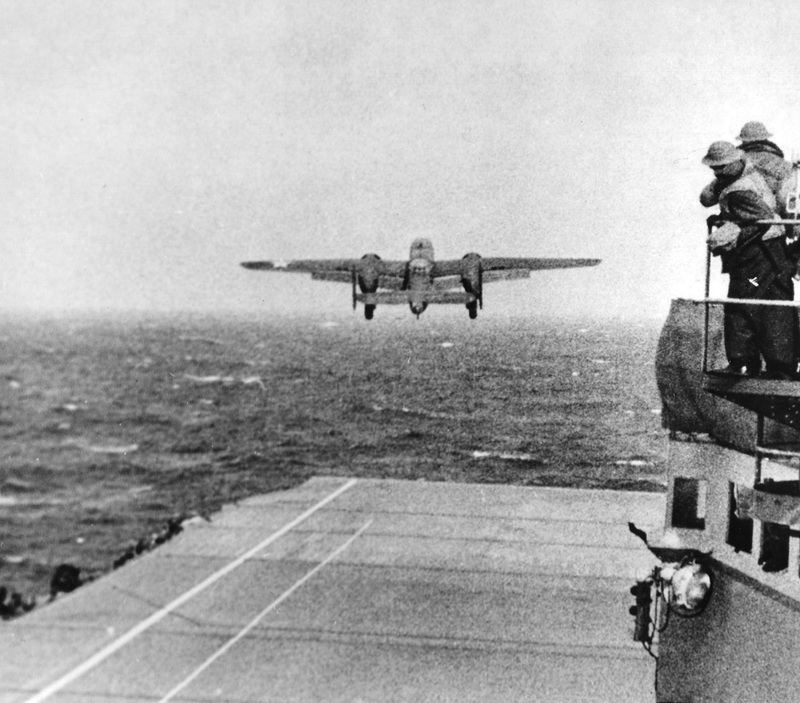 Doolittle chose to attack, and all 16 aircraft took to the air. 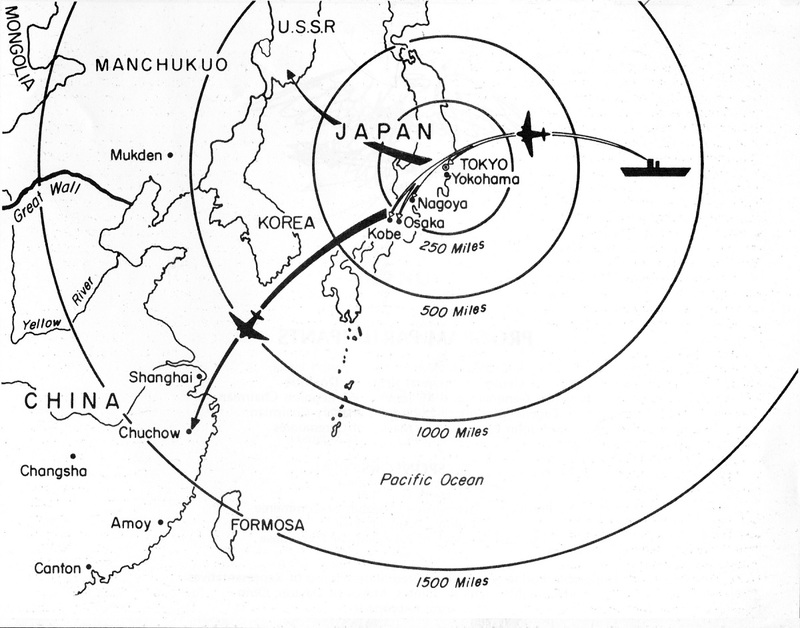 Once they reached Japanese homeland, the Raiders dropped their bombs on oil storage facilities, factory areas and military installations, and then headed out across the East China Sea. As their fuel gauges dropped, the Raiders knew they could not reach their designated airfields. One by one, they ditched at sea, bailed out, or crash-landed in China (one crew diverted to the Soviet Union). 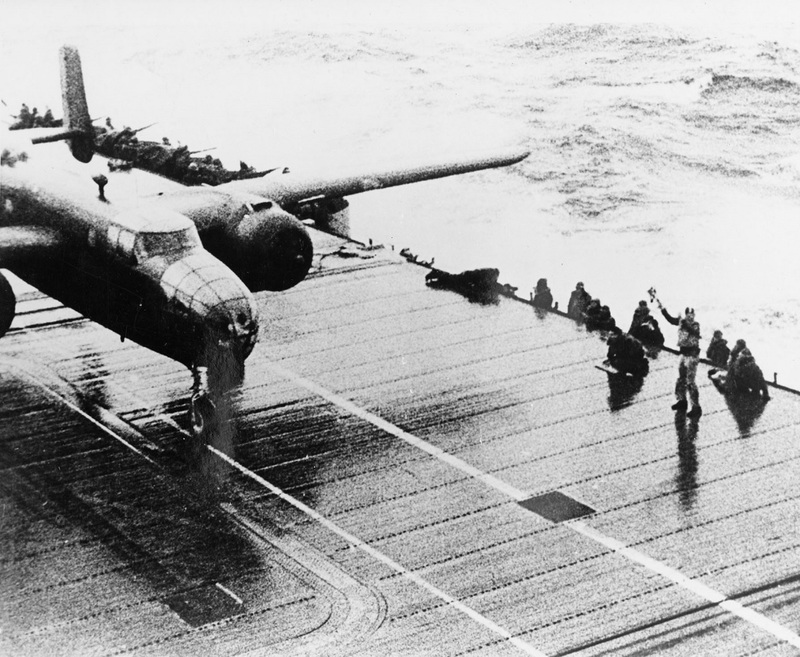 Luckily most of the Doolittle Raiders were able to reach friendly forces thanks to the help of Chinese people (Japanese forces later executed as many as a quarter million Chinese citizens in retaliation for this assistance). When news of the attack were released, American morale zoomed from the depths to which it plunged following Japan’s many early victories. 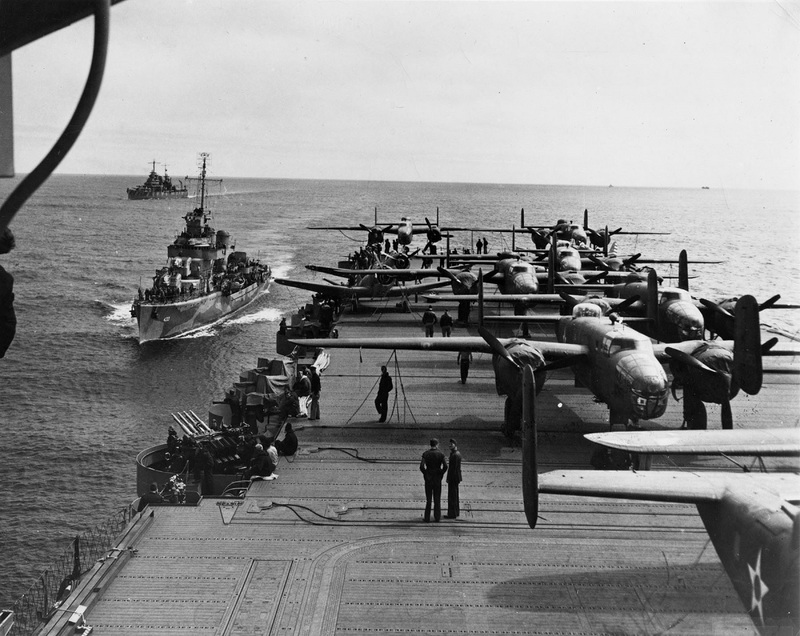 Moreover, even if the Doolittle Raid caused only minor damage, it forced the Japanese to recall combat forces for home defense and raised fears among the Japanese civilians. And to prevent any other U.S. air strike on the homeland, Admiral Yamamoto ordered the disastrous attack on Midway Island, which became the turning point in the war in the Pacific. North American B-25B Mitchell and Doolittle Raiders diorama in the World War II Gallery at the National Museum of the United States Air Force. The following video describes how this legendary mission was executed.